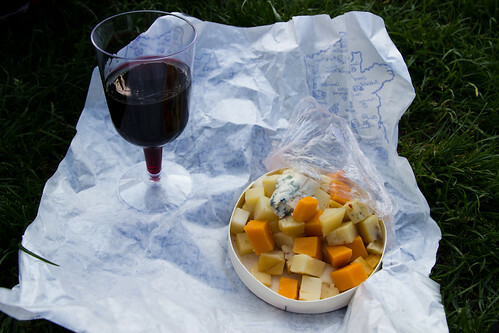 Aside from restaurant meals, we also explored other good eats in Paris - snacks, sweets, and picnic food - that made Paris the wonderful city that it is. The May issue of Bon Appetit magazine conveniently included a Paris dining guide in which there was a section on Dorie Greenspan's favorite bakeries and pastry shops. I would think Dorie Greenspan knows what she's talking about! 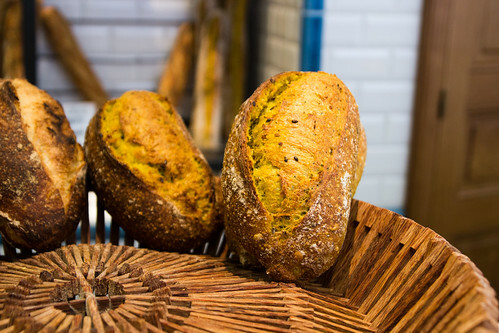 I was intrigued by her recommendation of curry bread from Gontran Cherrier (map) - we both love curry, after all - and since we were in the Montmatre neighborhood anyway, we decided to stop by the boulanger. The curry bread was awesome! 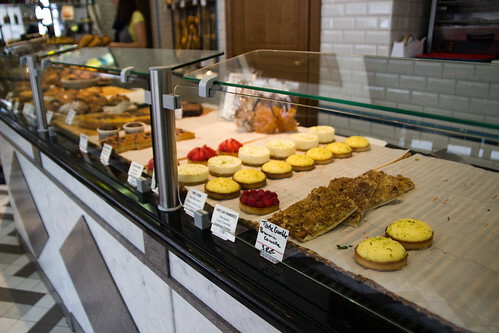 Paris is famous for its pâtisseries, of course, and we made sure to visit a few during our stay. La Pâtisserie des Rêves (map) was an eat.shop guide recommendation, and the shop on Rue du Bac, near the Musée d'Orsay, is super classy and cute. We bought a Paris Brest (also endorsed by Dorie Greenspan). I gave R. one bite and had the rest of it myself. ;) It was amazing! 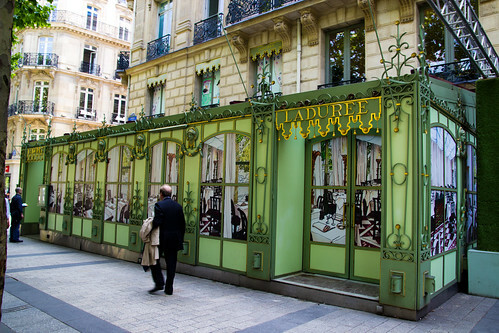 Strolling down Champs-Élysées, we came across Ladurée (map). The actual shop is closed for renovations at the moment, but there is temporary store right across the sidewalk (and there are other locations in Paris as well). 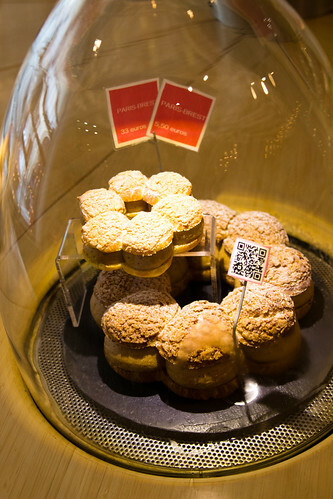 I didn't realize it at the time, but it turns out I was visiting one of the best macaron places in Paris! R. and I each ordered three - mine were cherry blossom, some rose flavor, and salted caramel (my favorite) - and they were knock-your-socks-off delicious. 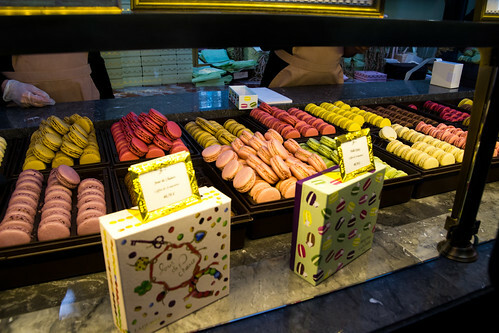 I've had many a macaron elsewhere in Paris (well, as many as one can possibly have in a span of six days), but nothing compared to the stuff at Ladurée. My only regret is that we didn't get to go back again before we left Paris! Another one of France's claims to fame, of course, is crêpes, which I absolutely adore, so I definitely had my share while in Paris. 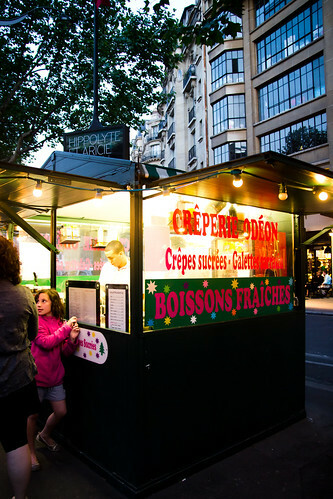 There are sit-down crêperies like Breizh Cafe, but crêpes are also found in abundance on the streets. One afternoon we took a stroll along the market street Rue Cler, and stopped by Ulysee en Gaule (map) for a 4.5 euro jambon-fromage (ham and cheese) crêpe to go (most on the menu were even cheaper), though one can have a seat at the restaurant as well. 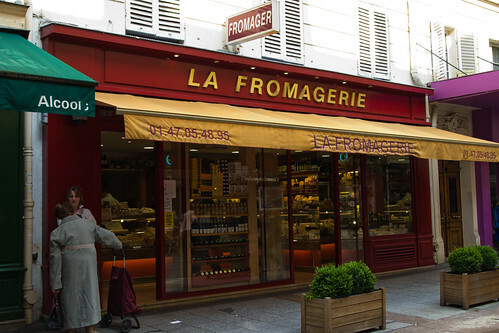 So yes, it is possible to eat relatively inexpensively in Paris! There is also this little street crêperie we visited near our hotel, by the Odéon Metro station, where we picked up some nutella crêpes for 3.20 euros. 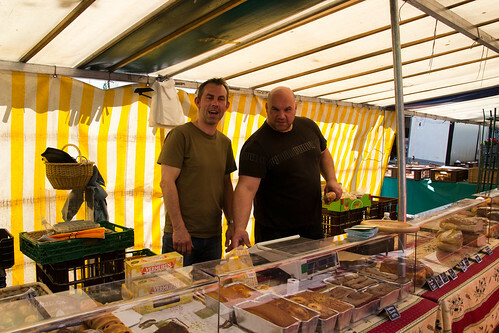 Speaking of food on the street, we also visited the Mouton-Duvernet Street Market (map) on a recommendation from friend Burgh Gourmand. 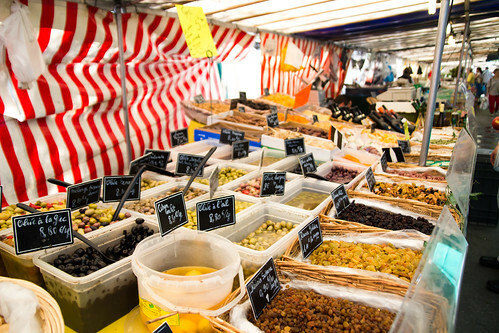 The Mouton-Duvernet Street Market is only open Tuesdays and Fridays, and we went there to pick up some food to picnic at the park next door on our way to Tour Montparnasse about 15 minutes away. 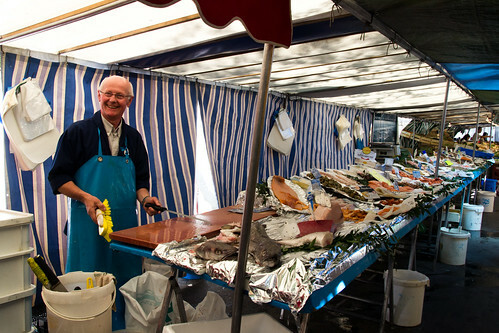 Unlike the folks who work at restaurants or tourist attractions, the vendors at this market don't speak English! Despite the language barrier, they were super friendly, and seemed excited that I was photographing them. One can find all kinds of goodies here. 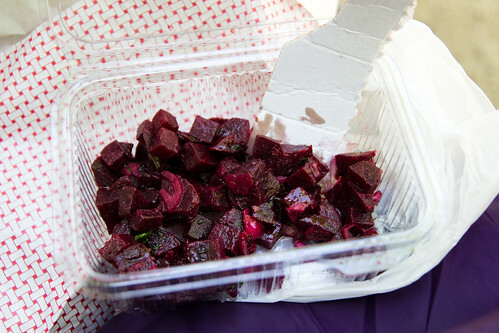 I picked up some delicious beet salad, but had to improvise by ripping part of a cardboard pizza box to use as a "spoon" since I had forgotten to ask for utensils, though I'm not sure they would have any even if I had asked. This market seems more suited for nearby residents who can bring the fresh produce, meats, and seafood home to cook, but they do sell prepared foods so picnicking is certainly possible with a little planning. 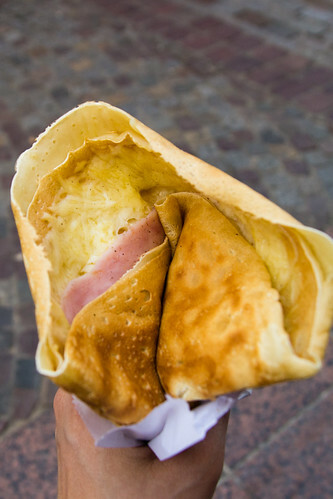 I mentioned getting a crêpe on Rue Cler (map), but that's not the only thing we got. 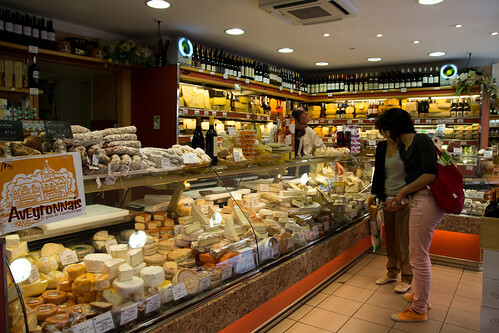 We stopped by La Fromagerie to pick up some cheese, and then grabbed a bottle of wine from a store called Nicolas, where they also sell mini plastic wine glasses. We then walked a few blocks over to Champ de Mars and picnicked by the Eiffel Tower. What a life! Not food related, but after our picnic dinner we climbed 720 steps up to the second level of the Eiffel Tower before catching the upper set of elevator up to the top. 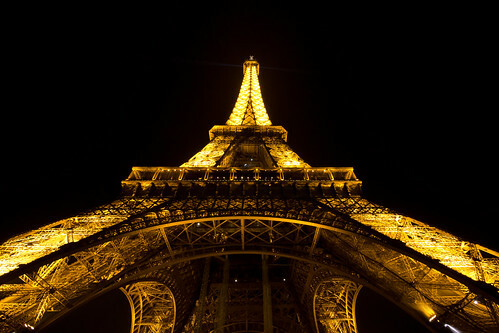 We watched the sunset over Paris from the top of the tower, then went back down to catch the light show from the ground. Ah...j'adore Paris! We will be back!